As the second term of the incumbent state governor, Ayodele Fayose, elapses in October next year. Some stakeholders of the Peoples Democratic Party, PDP, in the state have adopted the Deputy Governor, Kolapo Olusola, from Ekiti South Senatorial District, as the preferred candidate of the party. 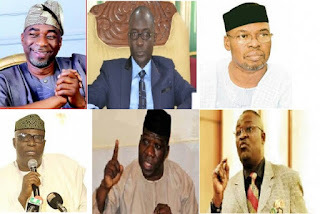 And not less than 36 chieftains of the Ekiti state chapter of the All Progressives Congress (APC) are jostling for the party’s ticket for the 2018 governorship election. Some of the aspirants have not officially declared their interest, but majority of them are intensifying their efforts in wooing party leaders. APC in Ekiti State has revealed that it only recognizes 25 aspirants showing interest in its ticket to run for the 2018 governorship election. So out of all these aspirants, Who will be the next Governor of Ekiti State?